Observation containers for school and university science labs. 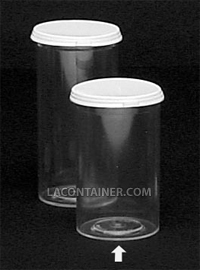 These glass-like polystyrene containers are a great choice for small animal specimen collection. They have a high gloss finish that is crystal clear and great for the observation of aquatic pond life or small animals and insects. Straight walls lend themselves nicely to the application of adhesive backed labels. An excellent choice for any school or university science lab. 38.1mm Dia. X 68.3mm Ht. 1 1/2" Dia. X 2 11/16" Ht.